Welcome to Microsoft's Windows 7 guide to restoring Windows Vista after installing 7 onto the same drive as Vista, after doing a custom install without formatting the Hard Drive. The best way to see if you have this option is to check the drive for a folder called "Windows.old", inside this folder will be a "Windows" folder, a "Program Files" folder and a "Users" Folder. If these are present then this process is possible. 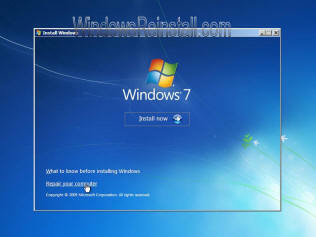 You will need your Windows 7 DVD or WinRE disk to complete this process. Click here Need Service Packs? Insert Windows 7 Professional into DVD drive, and then restart the computer. When "Press any key to boot from CD or DVD" appears, press any key. Now Select language, time, currency and keyboard input, click "Next" to continue. Now click on "Repair your Computer"
In the System Recovery Options window you may get a pause as Windows searches for operating systems, click the version of the Windows 7 you wish to remove, and then click Next. Now Type the following commands and followed by the "ENTER" key. Move "Program Files" "Win7old\Program Files"
Click Restart to restart your computer.